Here is a simple animated banner that I created by using a supplied PDF of an actual print ad. The banner ad is designed for the website that has a white background. The banner was tweaked in Illustrator and finalized in Fireworks. 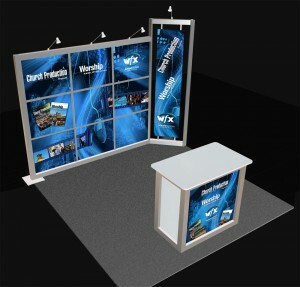 Here is some artwork that I retrofitted from a previous booth design. I used Photoshop and Finished in Illustrator to complete the layout. The challenge with these booth designs is to compensate for the grids that support the panels so that the artwork appears continuous across all panels. Illustrator has a new feature (Implemented in CS4) that allows for multiple art boards. This is especially helpful in developing a design that carries over many printed panels. Dragonflyworkshops.org is an online learning community website for Earth Expeditions and the GFP and AIP Master’s program at Miami University. The Site is designed on ruby on rails. I revised the look that is completely css based for speed. I also fixed and tweaked compatibility so that it works in all browsers without serious hacks. (Read IE8 compatibility). This was the first phase of the redesign. Next we are adding a ePortfoltio section for the students where they can build/create their final project as well as share resumes with potential employers. The update was designed in Adobe Illustrator and hand coded using standards compliant CSS. Hi! Welcome to Paul Sonoda Designs!